The is the most influential Lighting exhibition in Asia and is held in one of Canton’s most Industrial Cities Guangzhou based on the pearl river, that has a population of 4.6 million people. The exhibition itself attracted over 110,000 visitors this year from over 111 countries and more than 2,600 companies exhibit at the fairs 190,000 sqm grounds. Why did we go there ? The lighting Industry has changed dramatically over the last 3 to 4 years mainly due to improvements with LED technology meaning that LED light sources can now give lighting levels that can be used for domestic and commercial lighting applications. 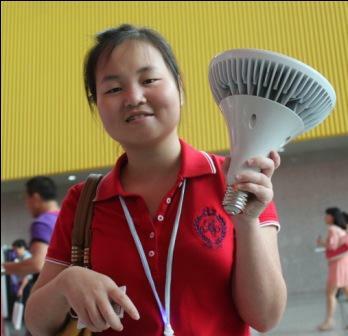 Historically China has been a “me too” supplier of light sources, manufacturing lower technology products such as Halogen and Incandescent lamps at a fraction of the price of the European manufacturers, gaining success by simply “buying” market share. 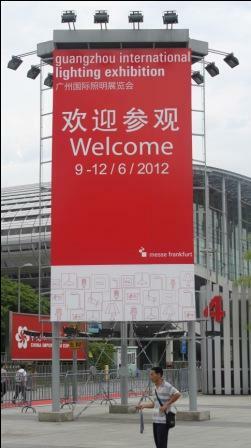 This has now changed with LED’s and China is now pioneering innovations with LED’s. The” tail now wags the dog”. At General Lamps it is important that we keep ourselves informed as to what is now available and which way the market might be moving in certain areas to best inform our customers, which is why we flew over to China. 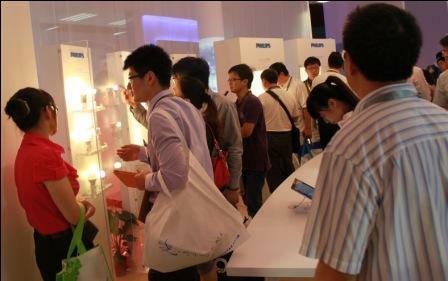 It was no surprise that LED Lighting dominated the exhibition. There where many GU10, GLS , Candle and MR16 LED lamps on show. It was pleasing to see that most manufacturers now offer dimmable LED lamps, this makes them more compatible to their incandescent or halogen equivalents. There were countless numbers of LED GU10’s on show all trying to get to the magical 350 lumen light output figure ( this is the light output of a 50w Halogen GU10) most can now achieve this and offer dimmable versions as well . It was disappointing that most of the GU10 lamps on show were considerably longer than a 50w Halogen bulb meaning that in a lot of applications they simply would not fit which would clearly limit their sales potential. As well as all of the lamp types you would expect to see there were some impressive stands from more well known names such as Toshiba, Philips , GE, Panasonic and newcomer Verbatim showing their latest offerings. That was the good , then there was the bad and the ugly, that you would expect from the Chinese. Lamps operated by a mobile phone, a key fob that doubles up as a miniature camcorder (at a lighting exhibition!) LED lights that plug into a bicycle wheel valve, battery operated builders floodlights, and enormous 125mm reflector lamps in LED. Speaking to the local Cantonese manufacturers regarding the state of the LED market in china we were shocked to find that 60% of LED manufacturers of light sources in the Canton region had gone bankrupt in the last year. We drilled into the detail and found the reason for this was that the Chinese government act as “business angels” for a lot of start up manufacturers, and had been disappointed with sales revenue. The action that they took was to insist that the manufacturers reduced their selling prices to both the domestic and export markets. This coincided with the government announcing new increased pay levels for factory workers. The net result being that the overhead of the factories has increased due to additional labour cost, but the profits were reduced due to the governments pricing directive forcing 60% of factories into an operating loss, game over ! We have returned with some new cutting edge products that will be available from General Lamps also at www.lamps-on-line.com very soon as well as the knowledge and understanding of what will be available in the future from the Lighting Industry.